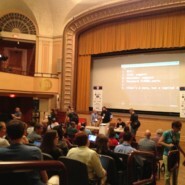 This past Saturday, I attended the (mostly) annual WordCamp in Philly. This year, it was held at The University of the Arts on South Broad Street. While the facility had some challenges, the Camp as always is well organized by Brad Williams and Doug Stewart. Four tracks were presented (user, power user, developer and designer). The first session I attended involved a checklist and review of things to remember when developing a WordPress site. Excellent session presented by Courtney Robertson. While I have developed many WordPress sites, it is always nice to see how others do it, better ways to do it and what I might be neglecting. The second session was Preventive Development and Maintenance. Very quick presentation but made me think about doing certain things differently, mostly to save myself from headaches down the road. The third session was about giving great support, presented by three “Happiness Engineers” from AutoMattic (the for-profit arm of WordPress). I learned a lot about how AutoMattic does their customer service, though in hindsight I’m not sure how that would apply to my practice. They are doing customer service en masse by email/chat. I give more personalized service by phone. It is clear that AutoMattic does a great job with customer service. Session number four was the annual WordPress security session. Every year, the presentation is different as the threats out there on the interwebs change. The “bad guys” come up with new and more complex tricks, which gets harder to fight. As I’ve said before about security, if someone wants to hack your site, they probably will find a way (see RSA [the security people!] or eBay). Security is about diligence, smarts and denying the hackers the consistent use of the hacked platform. Tony Perez of Sucuri presented this year (it’s usually his colleague Dre Armeda) and their presentation is always insightful and entertaining. Following lunch, I attended the keynote by Helen Hou-Sandi. She spoke about her company’s ability to allow her to work on WordPress core full time. The next session was an excellent talk by Vicki Boykis about effective blogging. She took a very different view of what makes an effective blogger, which I will incorporate into what I do (minus the really nice art). For session six, I decided to go to a more technical talk about custom fields. Custom fields are how you can customize the data types entered into the CMS to categorize the output. Excellent session. The last session of the day was by Doug Yuen talking about speeding up your WordPress site. While I already knew some of the tips he gave, you can always learn more. Thanks again to the organizers, all the sponsors, speakers and fellow attendees for an excellent conference.